Avron Gols is a Dunmer scout and Retainer of House Hlaalu protecting Rethan Manor. He is a medium trainer in Long Blade, Athletics, and Block. 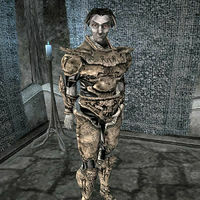 He wears a nearly full set of Bonemold armor, including the cuirass, both pauldrons, both bracers, greaves, and boots along with a common shirt with matching belt and pants. Avron also carries an Imperial broadsword. Aside from his natural resistance to fire and the sanctuary provided by his ancestors, he knows the following spells: Burden Touch, Feather, Fire Barrier, Frost Barrier, Jump, Strong Levitate, Levitate, Great Open, Strong Open, Wild Open, Shield, First Barrier, Second Barrier, and Shock Barrier. This page was last modified on 23 November 2018, at 06:15.